You’ll be welcomed with a taste of invigorating bubbles, and a delightlightful spread of fleshly sliced meats and fine cheeses (veggie options available). For around an hour, you’ll have two wine experts enchanting you with tales of the tipple. The wines will be £10-25 There are some rather unusal finds here, so if you like your wines to be made off the beaten track, you’ll eyes will light up like kids in a candy shop at the selection! I tried to phone most of those pre-paid today; however, instead of leaving a long-winded message, I thought I’d write instead. In London, it seems that there are an endless number of new restaurants, and places for gourmet experiences. Unfortunately, it’s very difficult for gourmet deli’s to stay in business. We had a wonderful time at our last event and it’s with great regrets (and big shock) that Market Quarter has closed down this week. One of the things I love most about London and Tastour for that matter, is that whenever one place shuts, it opens the door to explore something new. I have been working away today to find a replacement and I’m confident that we will have an equally fine time at nearby Jeroboams. 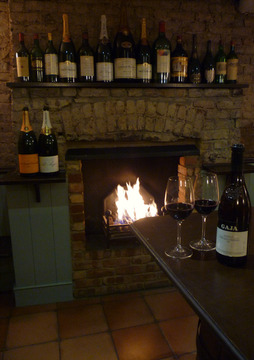 They even have a wonderful warm fireplace in their cellar. When I recently changed this event, and noted the Restaurant Racine, a member emailed and said ‘fine choice, one of my favourites in London.’ Enough said, right? Well this has been voted on of the Best French Bistro’s this side of the channel. The have a set course lunch for £15 – and a good selection ala carte. Bon Vivant members please log into the website for your discount. I’ve booked a table which required a £10 per person deposit. If you would like to join us, please choose the ‘LUNCH’ option when you buy your ticket for the wine tasting. We usually just split the bill evenly, but if anyone knows that they will only be having something small, please speak up and we’ll make sure it is fair. To reserve a spot for lunch, an additional £10 deposit is requested, £8 will be refunded. If you are unsure about lunch, you may be able to decide on the day. However, I can not guarantee that you will be able to sit with the group. It’s a very small and charming venue. I hope you agree that this is wonderful new addition to our 2013 calendar , and I’m really looking forward to sharing the experience with you all! This entry was posted in Events on 21 December, 2012 by adminfw.